This article is intended for developers installing Appcues. See the User Properties Overview for a higher level explanation. The only requirement is to send a user ID as the first argument to Appcues.identify(). See the User Properties Overview for recommendations. If you're installing Appcues for someone else, make sure you ask them what user properties they need. If you haven't installed Appcues, adding user properties is covered in the Installation Guide (Developer). You can add additional properties within the call, following the same syntax of the properties you're already sending. If you haven't sent any user properties yet, log into Appcues and go to the "Properties and Events" step in the installation guide for a snippet customized to your front-end stack. 1. Keep property names simple and understandable. The Appcues UI will try to reformat the property name into something readable, so a property like "days_since_signup" becomes "Days Since Signup" and "planName" becomes "Plan Name". To make things easier on your non-technical colleagues, send in property names that are simple and clear. Avoid names like, "property_1" or "base64UUID" unless that's a well-known label among your team. Send numbers as numbers, strings as strings, etc. 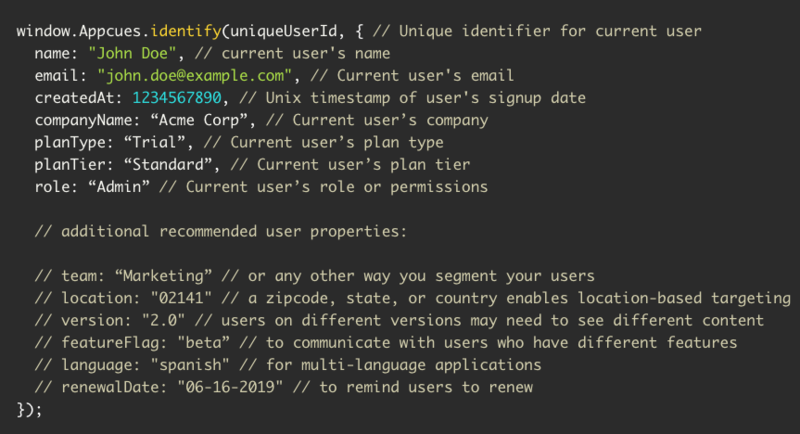 Appcues uses type inference to match targeting criteria, so you don't need to think about types. This is really important when doing comparison, since the number 10 is greater than the number 2, but the opposite is true if those values are converted to strings. In the same vein, if a value is undefined or null, either don't send it to Appcues, or send it as null. Do not send an empty string for any non-existent value. Lastly, make sure that each user property has a consistent type. As an example, "signup_date" could either be sent as a timestamp (number) or as an ISO date (string). Whichever you choose, make sure to be consistent every time that value is sent to Appcues. Inconsistency could result in over- or under-targeting content to users. Appcues uses UNIX Epoch timestamps for dates and times internally. 3. Only send simple (primitive) values (numbers, strings and booleans). Appcues targeting can only operate on numbers, strings and booleans. You can send complex objects in your Appcues.identify() call, but they will be silently ignored. We don't recommend sending objects to Appcues as a user property.